Need Some Spice in Your Classroom? Try Kahoot! For nursing educators who like their students awake and engaged in class, the challenge of finding activities that are both relevant and exhilarating remains a tough nut to crack. Some teachers in the College of Nursing and elsewhere have incorporated games into their classrooms to add competition, motivate students to stay engaged with material, and help students remember a lesson long after it ends. Enter Kahoot!, an online interactive quiz platform that allows the classroom to turn its energy toward the age-old goal of winning a game. Gamification has gained popularity in recent years as a tool for engaging people in tasks that might otherwise be un-stimulating to the point of boredom (think exercise apps, shoppers rewards programs, and even investing apps that create a prize system to keep users interested.) Several examples of gamification in the nursing education world already exist, such as this study which used Kahoot! to help drive pharmacology lessons home for nursing students. Kahoot! allows instructors to ask questions with a countdown timer and lets students play against each other, alone or in teams. You can add a song or video clip to questions as well. Learn more about Kahoot! on their website, and watch videos that highlight the capabilities of this platform. Wondering where you can get started using Kahoot! in your classroom? Check out this blog post on using Kahoot! in the college setting. Next, watch this video on how to get started. Have you used Kahoot! in your nursing classroom or in other professional development? Please comment below with your experiences! How do I sign up for a Kahoot account? The College of Nursing does not currently have a paid account with Kahoot. Sign up for a free account at kahoot.com. How do I use Kahoot? The video Lara references above (1:35) is a good visual demonstration that will help you get started in Kahoot. How do I launch my first Kahoot quiz in my classroom? Ask your students to open a browser and go to kahoot.it on their laptop, tablet, or phone. Then, ask them to enter the Game PIN, which you will see on your Kahoot interface after you launch your game at kahoot.com. Can I use Kahoot to take attendance? 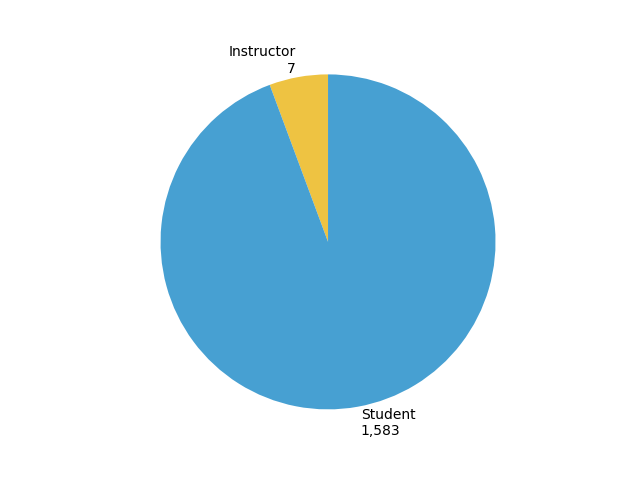 You can see how many students have joined your game, but they may enter a name that is not their own. If you need to know specifically who is attending your class on any given day, contact the CON IT department to learn about other applications that can easily do this electronically for you, like Top Hat. If you’ve ever felt the tension between multiple-choice tests and more complex assessments of learning, you are not alone. Read this EdSurge article on specification grading and its potential advantages over multiple choice exams for student assessment. 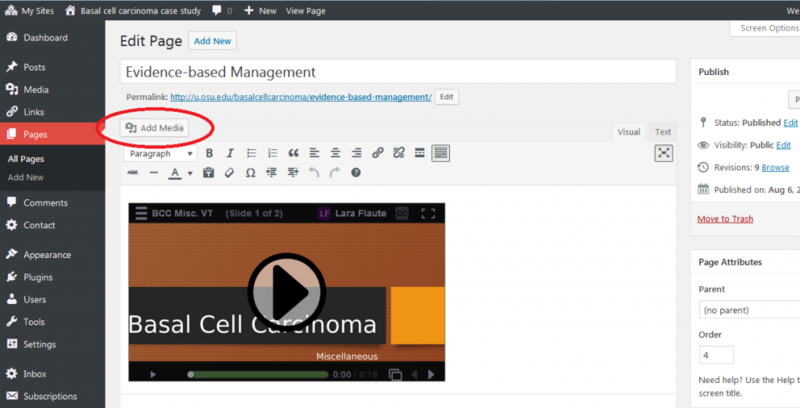 The grading tools in CarmenCanvas might make specification grading an efficient approach to engaging your students and finding out more about the course content they have learned and can apply to problems. The article also makes a case for the right time and way to use multiple choice tests. If you would like to explore CarmenCanvas tools (rubrics, SpeedGrader, etc.) for specification grading, please contact the mailto:con-it@osu.edu for more information. 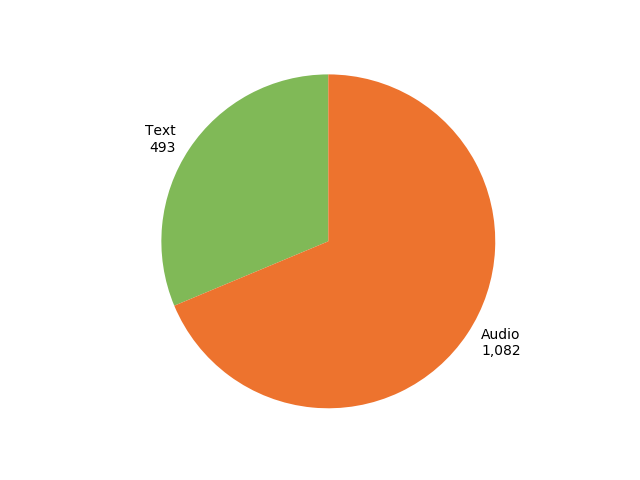 CON members spent a total of 904 hours on VoiceThread in April, creating over 3000 slides. 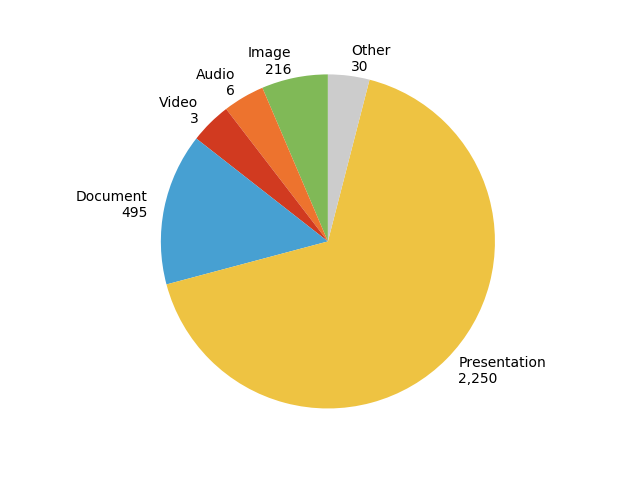 Over 1500 slides were viewed, and 1575 comments made! 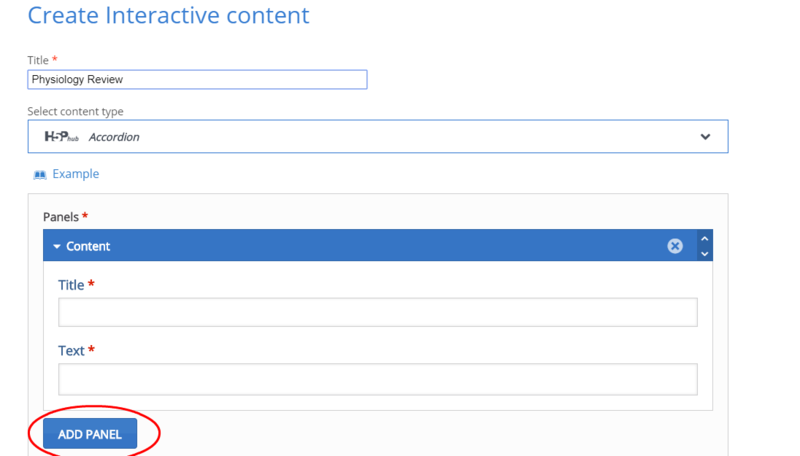 To create an interactive quiz of your own, go to the H5P content creation screen and select “single choice set” from the drop down menu. 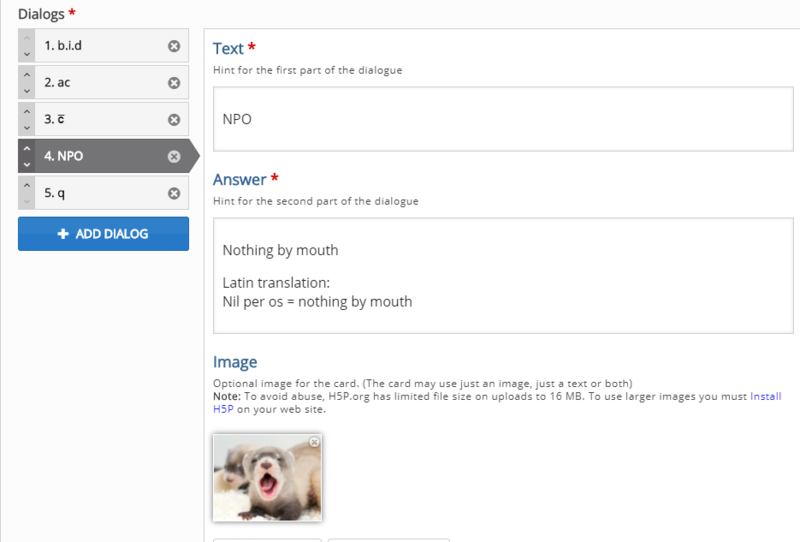 The first dialogue box will set the title for the entire quiz. 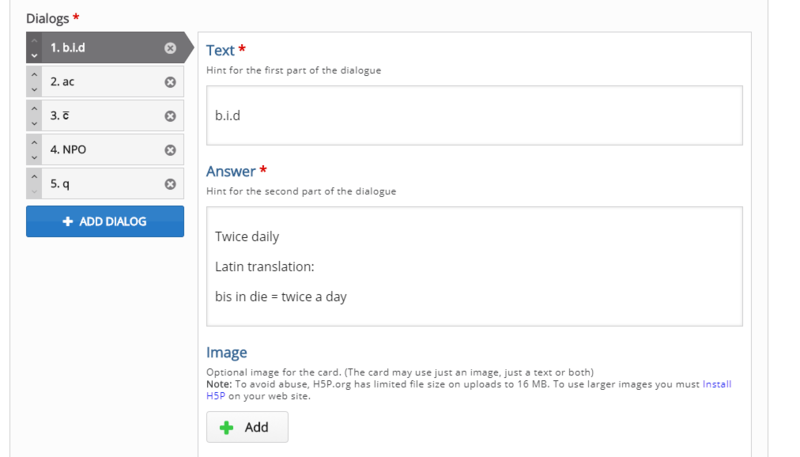 In these dialogue boxes, you will fill out the question and up to four possible answers. 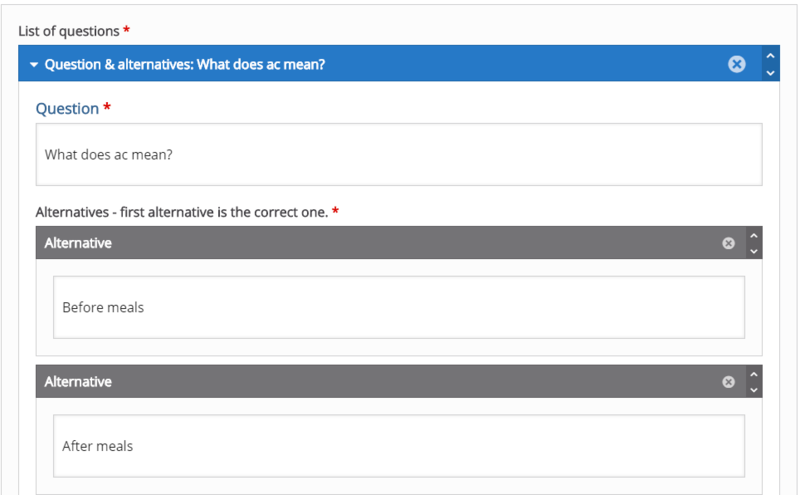 The form will default to two possible answers. You must click the grey “add answer” button to create new blank answer dialogue boxes. 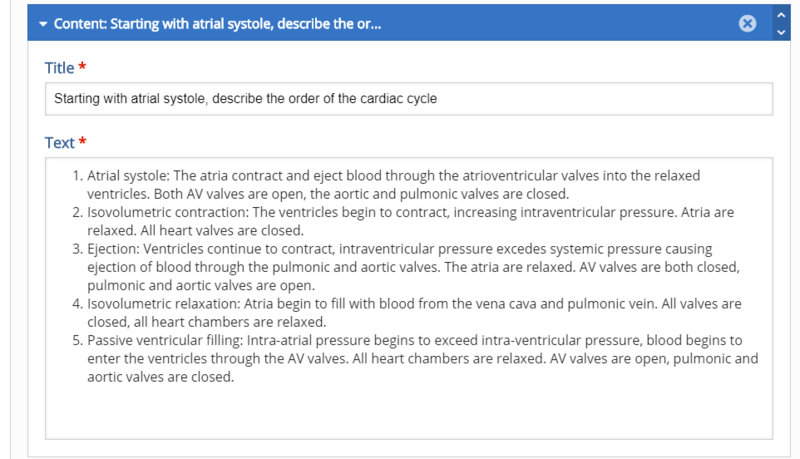 It is important to note that the first dialogue box is for the answer that you want the quiz to grade as correct. It is also important to note that the quiz will randomize the order of all four possible answers. This will be important later. Question 5 is an important example because I chose to include an “all of the above” style answer. However, it is important to note that even though this answer is the last one on the form, it will not necessarily appear as the last question within that answer set (eg: it could appear answer 1, 2, 3, all of the above OR 1, all of the above, 3, 4 etc.). For this reason, you should choose a wording similar to “all answers are acceptable” and avoid answers that make reference to other answers in terms of their location within the answer set. This image shows the grade ranges you can choose. This section starts relatively blank. 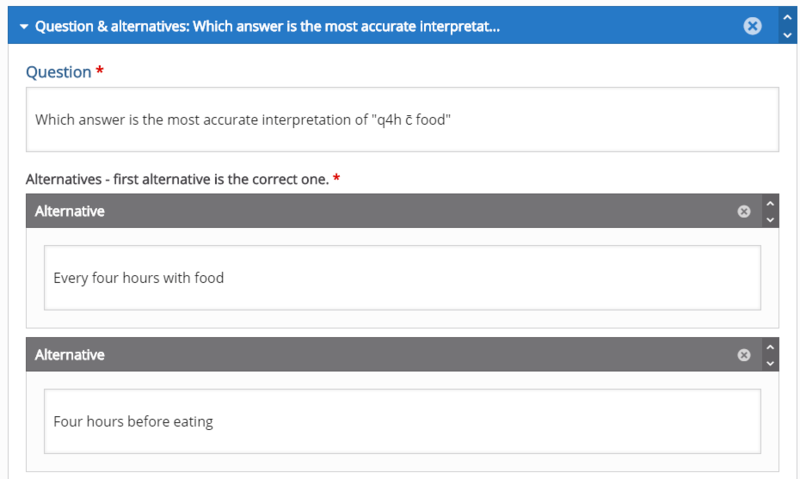 To create the grade ranges for this quiz, I clicked the blue “add range button” until there was one grade range per question, then clicked the white “distribute evenly button.” However, If you choose to, you can manually adjust the grade ranges. 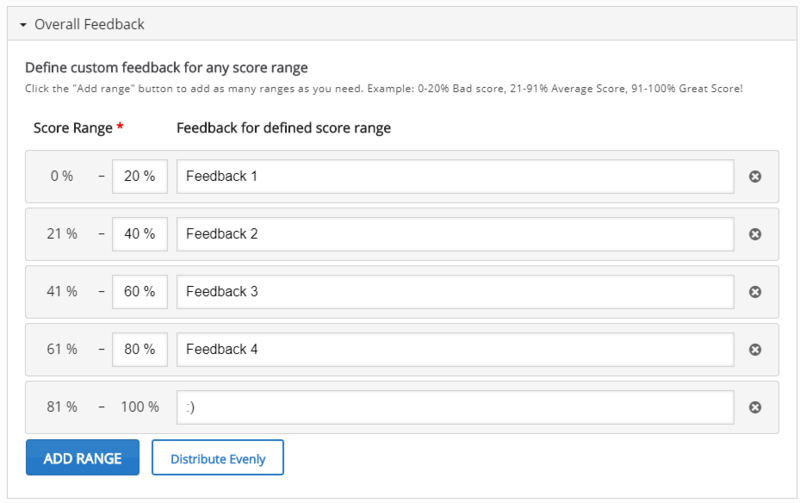 The text boxes next to each grade range are the messages that will appear if a student receives a given score. In these final steps you can further customize the behavior of the quiz and the messages and prompts that appear on the quiz. For this tutorial, these settings have been left as default, however I encourage you to play with these settings and contact CON IT for any additional assistance you may need. 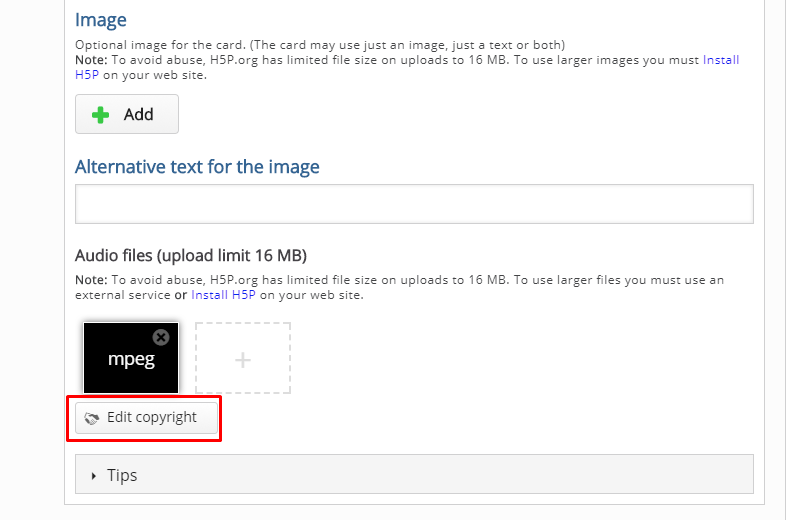 As with other content on H5P, you can edit the download, embed, and copyright buttons that will appear. Once you are happy with your quiz, click the pink save button. If you followed these directions, you should end up with a quiz identical to the one at the beginning of this blog post. 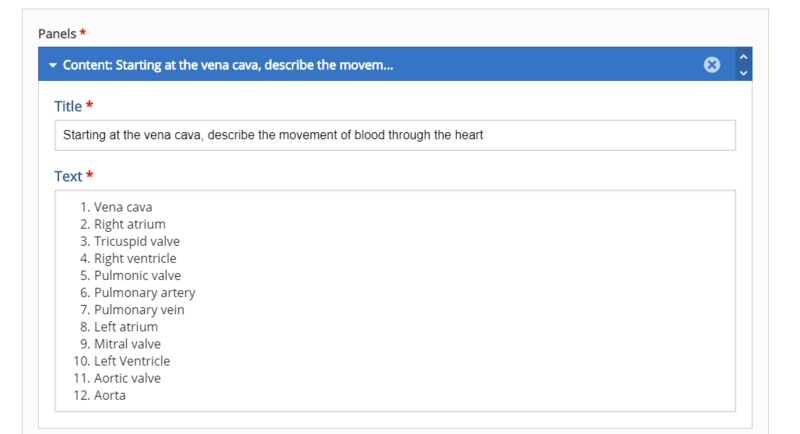 Once you have completed your quiz, it can be embedded into Carmen or into your u.osu blog for use as a study tool. For help configuring your quiz, or assistance in implementing an H5P quiz in your classes or study groups, please contact CON IT for additional assistance. Microsoft Sway is a program for creation of online presentations using a combination of text, images, audio, and video. Sway is similar to PowerPoint, but the presentations are easy to create and present on the web. 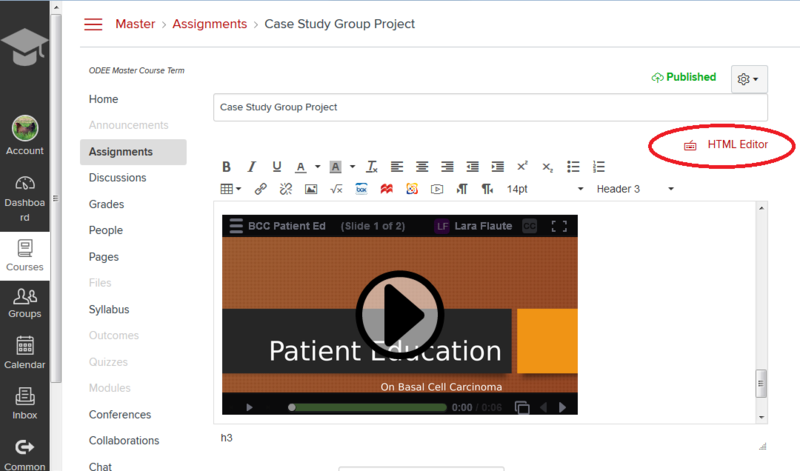 OSU students and faculty have free access to Sway through Office 365, so it is an excellent choice for students to share their course work in an online format. 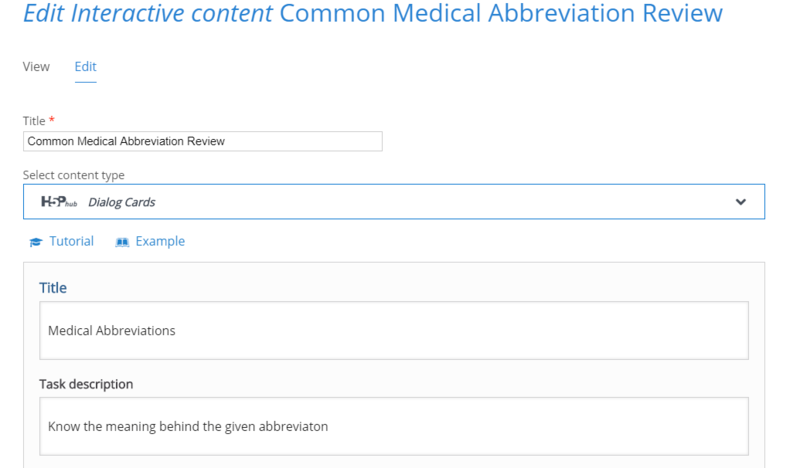 John Pryba covered the basic information you need to get started with Sway. View the recording here. 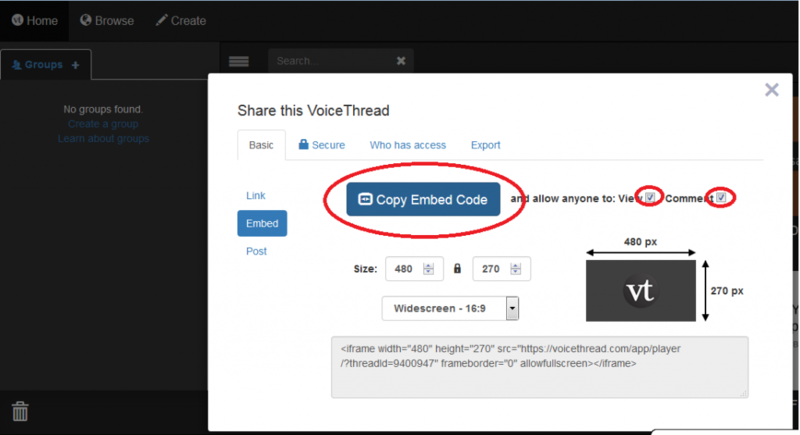 This post will walk you through the steps to embed a video on a webpage. 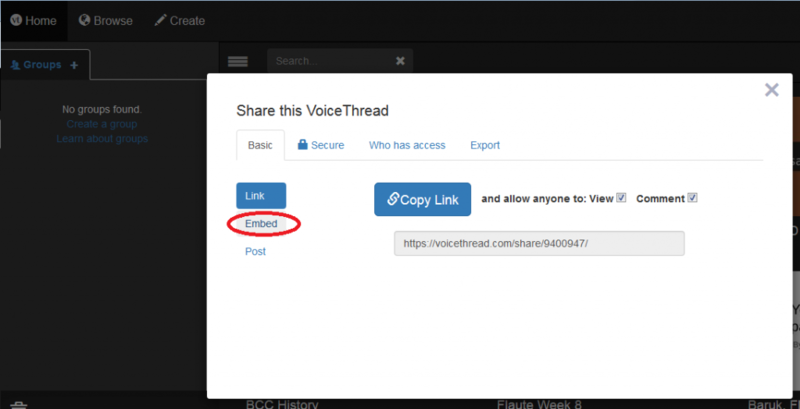 The images here show how to embed a VoiceThread video into a u.osu.edu webpage, but the same basic instructions can be used to embed videos into your Carmen classroom pages as well. Now your video is embedded in the page. Be sure to “Update” or “Publish” your page to save your changes!